Have multispectral camera, will travel! The Alexander Pope project continues this week. We are back at the Yale Center for British Art to do some scientific imaging on the marble bust of the poet Alexander Pope by the artist Louis Francois Roubiliac. Ruggero Pintus and Ying Yang, Postdoctoral Fellows at the Computer Science Department, are using the Imaging Lab QSI multispectral camera and a xenon light to measure the quantity of electromagnetic radiation that is reflected by the material of the bust. They will take a total of 8 images from every angle: 1 from the UV (ultraviolet) range, 6 from the visible light range, and 1 from the IR (infrared). Each series of 8 photographs is a more accurate way to acquire the optical properties of the studied object as opposed to an average photograph which only retains information from the red, blue and green spectrums. This information will give conservators the proper tools to study the spatial variation of the material properties. Ruggero Pintus describes a multispectral image as one that captures image data at specific frequencies across the electromagnetic spectrum. Spectral imaging can allow extraction of additional information the human eye fails to capture. Multispectral imaging aims at providing a description of the reflective properties of a surface. Multispectral images provide a more precise color analysis which makes these images suitable for the monitoring or restoration of artwork as well as any research activities that require high quality color information. Ruggero Pintus and Ying Yang, Postdoctoral Fellows for the Computer Science department, set up the multispectral camera and xenon light to take multispectral scans of the Alexander Pope bust. They will be measuring the quantity of electromagnetic radiation that is reflected by the material of the bust, which in this case is marble. 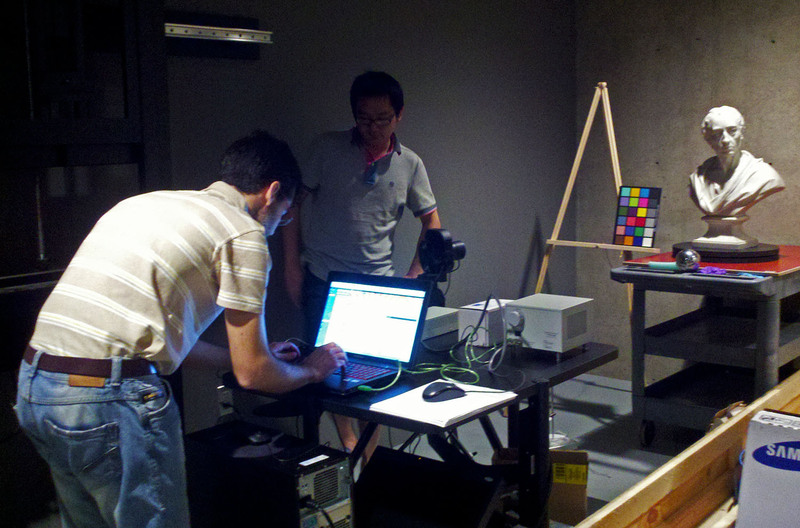 Ying prepares to calibrate the multispectral camera and xenon light by using the color chart and silver ball. In this photo, the bust is being illuminated with a xenon light source, that emits light from ultraviolet, visible and infrared bands. Each spectral band contains a continuous range of wavelengths. For each band, Ruggero and Ying will measure the quantity of radiation that is reflected by the material. This will allow them to study the geometry and optical properties of the bust. Ying rotates the bust in preparation for the next set of photos. Hurrah, that what I was seeking for, what a substance present here at this network site, thanks admin of this website.